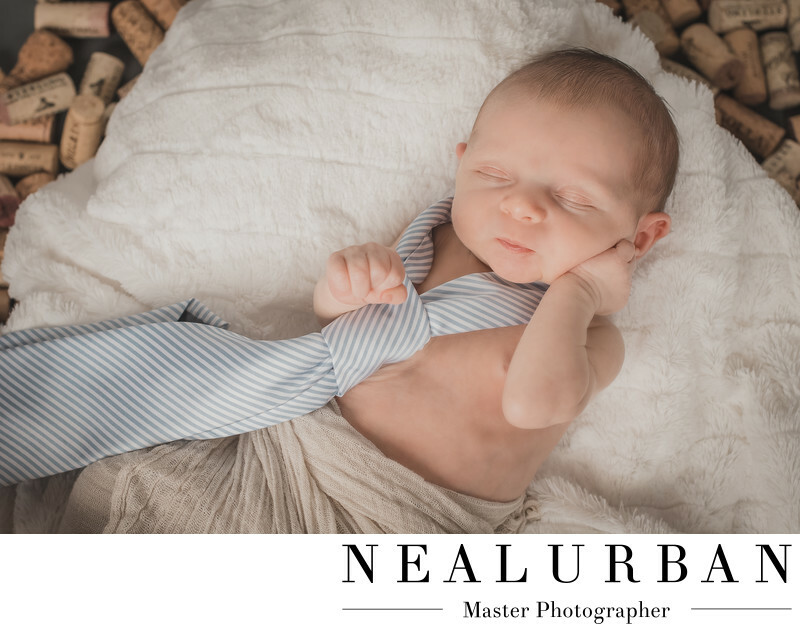 We schedule our newborn sessions at Neal Urban Studio. We do this because we can control the atmosphere. It needs to be really hot for the baby to sleep and very quiet. We are also able to build sets from scratch once we figure out a theme with the parents. Baby Henry was a cutie! His face is perfect here. He is peacefully sleeping on a bed of wine corks! His parents are son and daughter in law of the owner of Salvatore's Italian Gardens. The parents brought in wine boxes and a ton of wine corks. They knew we could come up with some ideas using these! We love wine! Nick and Lauren also brought one of dad's ties. We thought this was a great time to put it on the baby. It was just a cute detail. His little hand resting on his cheek is my favorite part of this image! We also did a golf themed set. Nick loves to golf. He and his wife are members at Park Country Club in Amherst,NY. Mom had a little knitted golf outfit for the newborn baby. Neal also loves to golf. He has a putting green in the studio we used. We also had some vintage golf clubs that we found at antique stores! We loved this newborn session. We can't wait to do first birthday cake smash photos next! Location: 2495 Main St Buffalo, NY United States.